Use convenient, prepared ingredients to quickly assemble these snack sized-bites. In a medium bowl, combine chopped chicken, 1/3 cup melted butter, hot sauce and blue cheese crumbles. Separate biscuit pieces and use hands or a rolling pin to flatten and stretch the dough into thin 3 ½" discs. Place 1 ½ tablespoons of chicken mixture on top of each piece of dough. Fold the dough around the filling, pinching sides together to form an enclosed ball. 2 tablespoons melted butter and sprinkle with cheddar cheese. 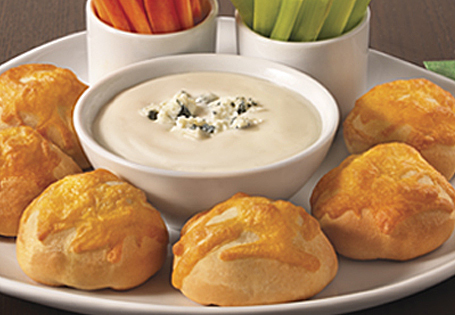 Serve warm with carrot sticks, celery sticks and blue cheese or ranch dressing for dipping.